The Champagne region is having one of its earliest harvests on record and to add to the excitement, this is also looking like one of the highest quality harvests in many years. I’ve followed this vintage closely, checking on the ripening grapes almost daily and watching carefully as the sugar levels rose, while monitoring the all-important physiological ripeness as well. I checked the equipment in the winery, saw that the team of pickers was ready (in Champagne, the law stipulates the grapes must be harvested manually), even made sure the unique presses used in Champagne were ready. I’m confident we’re going to have a fantastic vintage. And I know this without a trip to Reims this year. I’ve been tracking a friend in Champagne via his daily posts on Twitter, the affable Jean-Baptiste Lécaillon, who I met on my first visit to the region in 1992. Then, he was part of the winemaking team at Champagne Louis Roederer. Since 1998 he has been Roederer’s Chef de Cavesor cellar master, overseeing harvest after harvest. 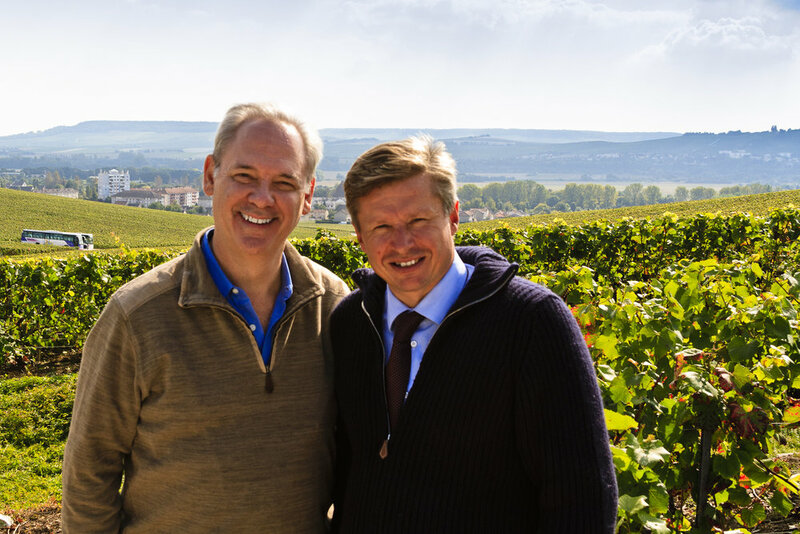 This year is his 30th harvest at Roederer and his 20th as the chief winemaker. As if Bacchus were aware of these momentous anniversaries, vintage 2018 is turning out to be phenomenal. In fact, Champagne, is scoring a trifecta, with the opportunity to harvest early (thereby avoiding any early autumn frosts or storms), harvest high quality grapes and, equally important, bringing in a large quantity of fruit. It will be several years before most of us consumers have the fruit of this bounty in our glasses, but it is good to know it’s coming. Why so long? To develop the depth of flavors that is emblematic of Champagne (the sparkling wine that only comes from the Champagne region), the law stipulates that non-vintage wines must age a minimum of 12 months on its lees and 15 months in total before release. In practice, only the least distinguished wines are given so short a time in the cellar; the better non-vintage wines are aged three or four years, and vintage wines, despite a legally mandated three year minimum, spend anywhere from five to 15 years in the cellar. Greatness takes time. When I began writing in earnest about Champagne more than 20 years ago, I had to go visit the region once or twice a year for several years to get a real handle on the elaborate process that converts sun, soil and rain into an effervescent liquid in one’s glass. Making sparkling wine by the traditional method is not only time consuming and labor intensive, it is complicated. That complexity could only be understood by watching the process step by step. I visited the Champagne region more than two dozen times, tasted thousands of wines (I know, it’s a rough job) and spent many hours talking with grape growers and wine makers. Jean-Baptiste has been one of my most frequent contacts, and he's been particularly generous at letting me work for free, as I gained experience by clumsily joining the pickers bringing in some of his precious pinot noir from one of Roederer’s prime vineyard locations. This year, perhaps because of his anniversary, JB has been particularly voluble on Twitter, posting photos every day, a process that lets anyone with a smart phone or laptop tag along with a great winemaker. Jean-Baptiste provides a daily commentary on how the harvest is progressing via the Twitter handle @louisroederer_ (don’t forget that final underscore), a parade of tweets that began early in the growing season. Thanks to his daily photos, I saw the results of the winter pruning in the vineyards, the all-important bud-break and his celebration of the arrival of veraison, the crucial moment when the hard and green young grapes begin the essential process of ripening, the skin slowly changing color and the berry softening as it produces more sugar (that will eventually be alcohol in our wine). Following JB’s tweets was like taking a daily stroll through the vineyard with him – checking the progress of the grapes, feeling his excitement as the extraordinary weather continued in early August and then the joy of bringing in the first pinot noir grapes. Soon, these will be pressed and the juice fermented into the base wine, the vins clairsthat, after years of cellar alchemy, may become the top wine at Louis Roederer, the famous Cristal. “I’m delighted to announce the official beginning of pinot noir #harvest18 at #Louis Roederer,” JB tweeted. “Weather forecast – ‘Cristal’ clear ahead!” What a tease! Now I have to engineer a visit to the Roederer cellars in February for the assemblage, the blending of those hundreds of vins clairsto make the final base wine that will get its second fermentation in those cold cellars. Over the years, the spent lees from that second fermentation will slow break down in the process called autolysis, their decay releasing amino acids and other flavor elements that so subtly create the taste that is only found in great Champagne. I’m dying to know how it turns out. The beautiful thing is, this entire process from bud break to glass can be followed in many wine regions of the world. To fully appreciate what is in your glass, take a stroll with a winemaker. Most wineries post on Twitter and Facebook and Instagram. Follow your favorites – you will be surprised how your bond with favorite wines grows, and how much you feel a part of the wine making family! There is no substitute for walking through a vineyard and then tasting the wine that particular piece of earth gives us, but social media certainly narrows the gap between simple appreciation and deep understanding.